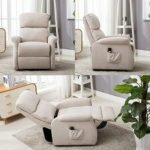 If you are doing research on electric stand up chairs you may also be interested in finding a best all around power recliners and how to choose an electric stand up recliner for elderly. 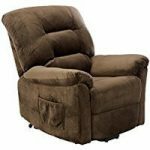 This Ashley Furniture Ernestine Power Lift Recliner is a top choice for lift chairs. It is an all around comfortable chair that maybe a good lift chair for Medicare reimbursement. It comes in a good size that fits a large number of users and reclines nearly flat, allowing for multiple uses. The dual motors allow high position customization and are easy to use for those who may be tired mentally and/or have signs of dementia. Massage, heat, and zero-gravity positioning are lacking, but this chair comes with many features at an economical price. The process of qualifying and obtaining lift chair for medicare reimbursement is easy. 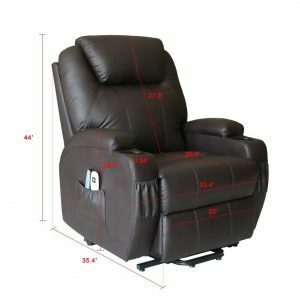 This power recliner has a seat height of 20.75 inches, a width of 22.75 inches, and a weight limit of 300 pounds. These dimensions make this chair ideal for most users between 5’4” and 6’2” tall. It is neutral in color so that it can fit in with any room style and comes available in soft, slate gray polyester fabric. 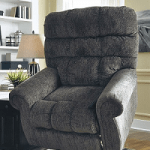 This Ashley Furniture lift chair is a three position model, allowing it to recline to a nearly flat position. The functionality makes this ideal for users that spend a large amount of time in their chair, as it can adjust to seated, relaxing, and napping positions. The dual motors control the footrest and backrest independently. 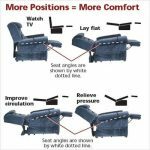 So you your position is customized for optimal comfort. This chair does not recline to flat or into the zero-gravity position, making it less ideal for users with heart conditions. 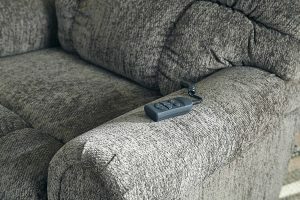 This chair includes a simple remote that utilizes only four buttons. Two buttons control the backrest. While the other two control the footrest. Each of these sets includes an up and down button. This simple design makes this chair ideal for users with dementia or any mental challenges. 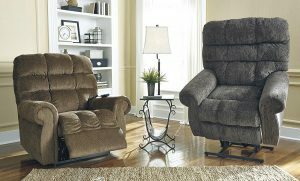 These lift recliners are covered in polyester fabric for a soft feel for the users. The chair utilizes a single chaise design. This eliminates gaps in the fabric and padding that can cause discomfort. It is also very comfortable with high-quality foam padding. This chair lacks heat and massage capabilities, which makes this stand up chair less than desirable for those with diabetes, edema, or with poor circulation. The backrest cover of this chair is easy to remove. Cleaning is easy. This chair also only weighs 150 pounds and can fit through a 30-inch doorway for easy setup. Only 16 inches of space is needed between the chair and the wall, making it one of the more space-efficient models available. It comes with a one-year warranty and the option for either a three- or five-year accident protection plan. 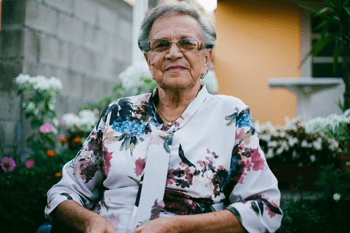 If your doctor has suggested that you get a lift chair to assist you than you will need to ask your doctor for a prescription to begin the process for medicare reimbursement. 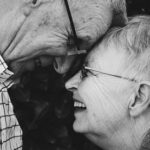 Here is some additional information about selecting a chair for elderly. 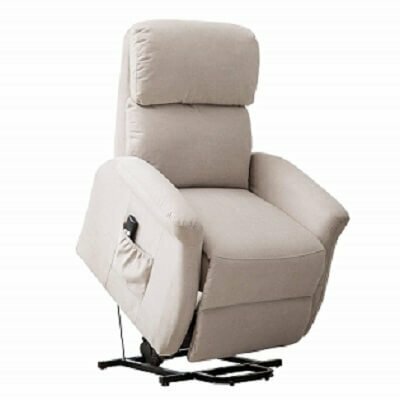 The U-MAX Massage lift assist chair is a great option for smaller users, especially those who would benefit from massage capabilities. This functionality provides a lot of customization, and is great for users with chronic pain or poor circulation. 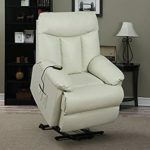 This chair also includes easy-to-use dual controls for both reclining and massage. However, this chair is limited in its positions. It can only recline to 130 degrees, which is not ideal for users with heart conditions or that sleep in their chair. You may want to read about how to select the perfect lift recliner. This lift chair has a seat height of 19 inches, a width of 20 inches, and a back height of 27.5 inches, making this chair ideal for users under 5’4” tall. This chair also has a weight limit of 330 pounds. It comes in either brown or black leather, making it a stylish addition to any room. This U-Max power lift chair is a two-position chair and reclines to 130 degrees. This is fine for the user who sits to relax involved in a hobby, reading or watching TV. It is not intended for over night sleeping. It is also not recommended for users with heart conditions. 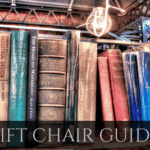 If you are looking for a chair for a user or yourself with a heart condition there are specific chair functions that you need to evaluate. This lift assist chair is fully automatic and has two separate remotes for easy controls. One of these remotes has a simple two-button control for lifting and reclining, while the other has easy-to-use controls for the massage capabilities. 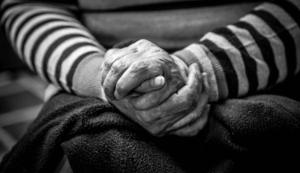 These controls are great for all users, especially those with dementia or mental impairment. This chair is made of PU leather and is packed with spongy foam padding for added comfort. This lift assist chair also has massage and heat capabilities for four different body parts, including the lower legs, thighs, lumbar, and upper back. There are also five different modes, including pulse, press, wave, auto, and normal for customization. This massage makes it great for users with chronic pain, diabetes, or poor circulation. This chair also comes with dual cup holders and four pockets for easy storage. This chair is easy to assemble and has a very small footprint, needing to only be positioned 10 inches from the wall. It also comes with two wheels, making maneuverability easy. This product also comes with a one-month return and one-year accessory replacement warranty, and a three- or five-year protection plan can also be added. This chair is a perfect fit for most shorter height users and really bully’s the competition with all that it offers.